What's ahead for mobile and mobile application development in 2016? The Enterprise Mobility Exchange and VDC Research's new report, "Looking Ahead to 2016" has useful insights for enterprises looking to accelerate their move to mobile. The report starts with a look back at the state of mobile in 2015, and found that business users were not pleased. The report says, "Most users were dissatisfied with the pace of their organizations' mobile initiatives and mobile application adoption in 2015." The reason? Companies haven't yet built a mobile-first strategy. They haven't done it, the report concludes, because they haven't get bridged the gap between their IT departments and their lines of business. 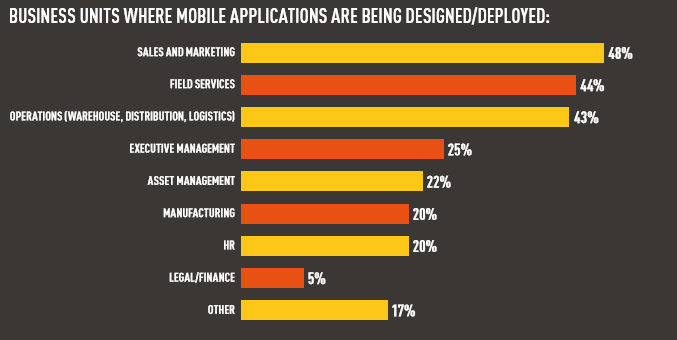 Where and How Mobile Applications Will Be Deployed in 2016 [caption id="attachment_13145" align="alignnone" width="677"] Looking Ahead to 2016, Jan 2016, VDC Research[/caption] One of the survey's most useful findings is where mobile apps will be deployed this year. It found that sales and marketing departments will use them most --- 48% of companies say the applications will be deployed there. Next in popularity is field services, with 44%, and operations, including warehouse, distribution, and logistics, with 43%. No other department was able to crack the 30% barrier. Mobile apps for executive management will be developed in 25% of companies, asset management in 22% of companies, manufacturing and human resources in 20%, and legal/finance in 5%. The volume of enterprise mobile apps will pick up in 2016. The study says that large organizations have already deployed, on average, 128 mobile applications, and they expect to grow that by more than 16% in the next 12 to 24 months. As for mobile development tools, the survey found that rapid mobile application development (RMAD) platforms are becoming increasingly popular. In 2016, the report concludes, RMAD platforms "will flourish." The year will see the advent of a new mobile trend --- bring your own development tools (BYOT). The report says that allowing developers to use tools of their own choosing - as long as those tools support a wide variety of platforms and protocols - will take off in 2016. The report concludes, "Not only does the approach cut down on the learning curve for an organization's in-house developers, but it also makes it easier to bring in outside help when it's needed." To read highlights of Alpha Software's recently commissioned survey of mobile app developers, click here. To read why mobile app developers are choosing Alpha Anywhere for rapid mobile app development, click here.